It’s exciting to begin a memoir in a community of brilliant bloggers. I am blessed to have each of you join me on this journey backward in time—this travel to a sometimes painful past. But in an effort to explain some of the insight you’ve helped me gain this week, I’m going to digress into myth. It’s Friday and tomorrow is my 49th birthday, so think of me as a soon-to-be-old lady whose senility has brought on this bout of babel. However, it’s true that, according to Greek mythology, if Psyche wanted to be reunited with her bridegroom Eros, she had to complete 4 tasks assigned to her by Eros’ mother Aphrodite—tasks that Jungians suggest represent the female process of individuation, a woman’s journey toward emotional maturity. The first of these tasks—sorting a huge pile of seeds—mirrors, some scholars believe, the psyche’s effort to take stock, sort out options, assess what’s on hand—work that is thought to be foundational for female emotional growth. So, in good literary form, over the next week, I’ll be sorting sources in a first step toward making this memoir less a matter of myth and more a matter of fact. This brilliantly summarized so many comments that had come before and mapped a path ahead that I believe I can, indeed, follow. 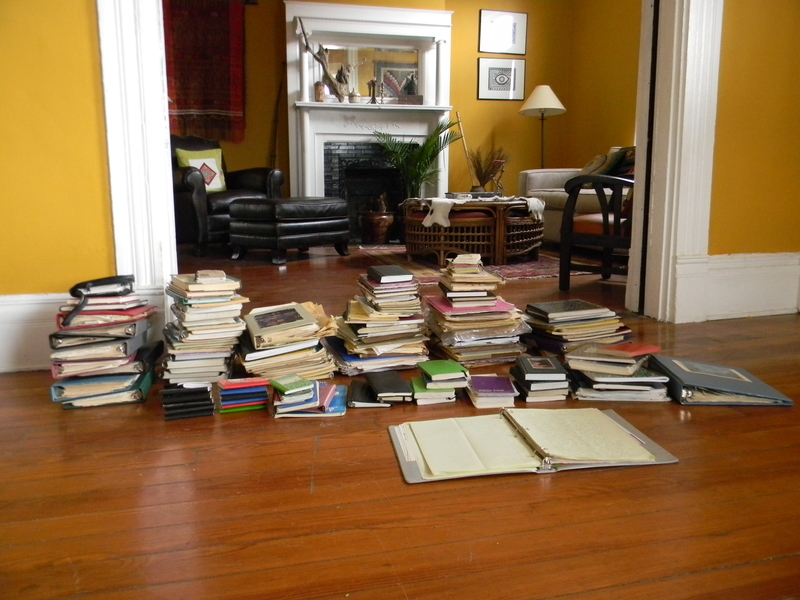 So in an effort to select a month to begin writing about, I’ve dragged a life-time’s worth of journals from the attic and am sorting them, first according to year and then according to month, so I can assess and make an informed decision about how to proceed. So as we head into another weekend, a birthday weekend for me, I want to remind each of you how much I appreciate your kind comments, your helpful suggestions and recommendations. Your support will help me make this memoir happen. I love you all! This entry was posted in Blogging/Writing, community, memoir and tagged blogging, comments, community, gratitude, Jung, memoir, myth, mythology, psyche, Writing. Bookmark the permalink. Aw–thank you, Amanda! Your advice was perfect, so, so perfect. And yesterday Sara and I bought a VHS to DVD recorder, so I can travel with the tapes, which now take up several big boxes! Thanks, Kirsten–are you still in Uganda? Happy Birthday Kathy! What a great gift to give yourself – sorting your seeds as it were. We will be cheering for you as you take on this journey! Great advice from Mrs H. And I am releasing a bunch of balloons and best wishes for your 49th birthday. I’ve said over and over that my great transformation began in the years leading up to 50. What an exciting time for you to be taking control of your life in a whole new way. Yes, it’s a powerful time–the last 40s! And thank for the balloons–I’m catching sight of them on the horizon just now! Happy Birthday, Kathy! Thank you for sharing your journey with us. While your journey is unique in many ways (as it should be) it also speaks volumes to many as we travel through our own mythic journeys. I’m glad we are all together in some ways to face whatever transformations come. enjoy sorting your seeds. Ah, yes, that’s the power of archetype–isn’t it! For my expereince to speak to those who have had very different experiences would be the ultimate success! I love the way the human story is so often variations on the same theme! and, I LOVE your saffron walls. Yes, it is a kind of travel! It really is! Yesterday Sara and I went shopping and out for breakfast and lunch. The last stop was our favorite book store, so we came home, crawled in bed, and read. Life is so exciting here in Kentucky! That A.Hab. is one smart cookie! One step at a time is always a little easier to swallow, and I am excited to get to follow you on your journey! She is a smart cookie! And so are you, my dear! Hugs to you this morning, Miss Tori! Happy Birthday….sounds like you’ve got a good start on the writing. Happy birthday, Kathy! It sounds like you have a wonderful road map to help you forge ahead into a new and exciting year of your life! Enjoy your special day tomorrow. Thank you, Dana–Miss Freshly Pressed–so, so proud of you. It’s fun isn’t it?! When I was pressed I was bonkers with excitement! What a wonderful endeavor. And the photograph!? It is marvelous. I love the stacks of journals, and the beauty that seems to emanate from them. I wish you courage and steadfastness in your work. Live your life, cherish your moments – present and past – and reflect on the sublime. You are taking on a marvelous task. And, oh yes, Happy Birthday! Thank you, David. It is a huge task, but I’m looking forward to it! Glad you find my stack beautiful. Sometimes it looks more daunting to me. But, gosh, thanks so much for taking the time to read and comment. I SO hope you’ll come back and join me on this journey! No! I typed “49”? I absolutely meant “29”!!!!!!!!!!!!!! Thank God you caught the typo! Really enjoyed reading this! I love mthic imagery! Thanks so much for taking the time to read and comment. Myth fascinates me, as well! I hope you’ll come back! I really do!!!!!!!!!! What a gift to be able to go through details of the years of your life. I only have that with travel journals taking me back through various trips and of course my blog for day-to-day and then my faulty memory LOL. As with anything big – start at the beginning. That’s exactly why I’m so glad to have the journals, cause my memory is SOOOOOO bad! Glad I’m not the only one! Where have you traveled? I’d love to know–will check out your blog! Seriously? Those are all your journals? I would be terrified to go through a similar stash. Thank goodness my journal-writing was squelched by an early case of writer’s block, or possibly a case of beer–it was about that time in my life. Else I’d have lots of evidence of self-importance, self-delusion and puffery, and I like my amnesia better. But good for you. Yes, that’s them–but I started writing when I was young. There’s a lot to be said for amnesia–for sure! Thanks so much for taking the time to read and comment! Hope you’ll come back! Old? On your 49th birthday? That means I’m ancient… lol! Thank you, Robin. It’s been a great weekend! Oh my gosh… look at all those journals! I am in awe that you were so faithful to your writing over the years. P.S. Happy Birthday, my friend! Thank you, Terri. I can’t believe I have written so much either. It’s kind of daunting when I think about trying to sort it all. Last trip was Burma/Cambodia but traveled a lot through Asia, parts of Europe and of course the Americas. But never a long-stay which is how I found your blog. Living in the country – what an amazing experience. You are so right. It is powerful to live in a country, as it has a chance to really become a part of you. I think that’s why it was so hard to leave Haiti– I felt like I had lived the place, breathed it, cried it! That is one BIG pile of journals, Kathy! I hope you’re having a relaxing birthday! Am behind on my reading . . .
A belated Happy Birthday to you! I hope that you had a wonderful day. Best wishes for the year ahead. I’m way, way behind, Lisa, so I understand! Thanks for the sweet birthday wishes. It’s been a lovely weekend! Happy birthday, Kathy – hope it was a fabulous day. I’m glad you’re choosing one step at a time – seeds take some time to blossom into flowers or trees, and they need all the right conditions and nurturing. You can do this, Kathy – it’s so wonderful to be part of this process with you. What a great comment, Sunshine! Yes, that’s true. I hadn’t thought of that. I’m so pleased to share this process with you! Seeds need Sunshine! 49? I’ll take it. Happy birthday to you! Hope you have a blast. It was a really, really great birthday! The best I’ve had in years. I guess things just get better the older you get!